As the mother of two children in elementary school, the past few weeks have been a little crazy with back-to-school clothes shopping, purchasing and sorting school supplies and meeting with our new teachers to discuss expectations for their learning this year. While I love summer, balancing work and the kids can get more challenging when you work from home. Because of this, I’m often ready for the start of school because I can get back to focusing on my writing projects without feeling guilty. As I was knee-deep in my daughter’s closet a few days ago, I started thinking about how other writers can also benefit from this hectic time of year, too. 1. Stock up on writing supplies. 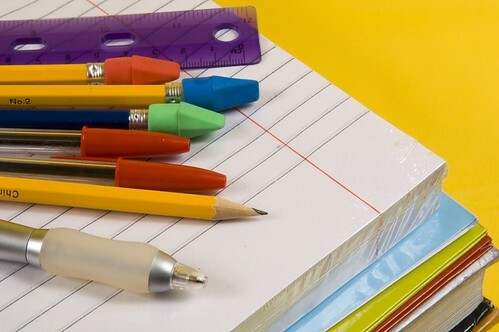 Take advantage of back-to-school sales and coupons at your favorite retail stores and restock any office supplies that might be getting low. I personally used my discounts to purchase Post-it notes, notepads and printer paper, something I never can seem to keep in stock. 2. Organize your workspace. Prepare for your next season of writing by cleaning off your desk, organizing the files on your computer and recycling any old books or magazines cluttering up your workspace. Chances are, you’ll come across some old story ideas you never fleshed out or unearth some new ideas along the way. 3. Learn something new. Make a list of writing-related books or blogs you want to check out and dive in. Or, join a professional organization or take a class on a topic that will benefit your writing career, whether it’s online (we have an impressive roster here at WOW!) or at a local college. 4. Hold yourself accountable. My children receive report cards three different times throughout the school year. As writers, we should also set goals designed to encourage us to improve our craft or break into a new publication. Last fall, I actually wrote up an informal list of writing goals and tacked it up on the wall in my office. I’m proud to say that while I didn’t meet all of them, I did accomplish several of those goals and having a visual reminder helped me stay motivated. 5. Display your work. My refrigerator and bulletin board are often covered with my children’s artwork and writing assignments. Why can’t writers do the same? Create your very own inspiration board, whether on Pinterest or on the wall near where you work. Cut out published articles or pages from a recent chapter you’ve been working on and pin them there as a way to celebrate your hard work along the way. Are you doing anything differently this fall? I’d love to hear any new goals or ideas you have in the comments below! Great tips Renee. I always pick up office supplies for myself as we shop for school. You can always get cheap pens, paper, notebooks, etc. I really should get another flashdrive on sale too, and back up more of my documents! I love the idea of displaying our work and accomplishments on the fridge just as we do our kids! Great tip. This year, my almost 3 year old (in October) is starting preschool 2 mornings a week. I am going to try to be very disciplined and drive straight to Starbucks as soon as I drop her off instead of thinking: I could go the grocery store on my own. Let me run this errand, etc. So, we'll see. It will be a new change for all of us! Marcia - A new flash drive! I definitely need one of those too. Thanks for the reminder! Margo - I love your idea of heading straight to Starbucks right after preschool drop off. There's one right across the parking lot from my kids' school and we've been having a love affair for years! This year, I've decided to add in time for exercising and writing fiction to my daily schedule. In the past, I've tried to reserve daytime hours for my paying contact work and tell myself that I'll work out or write a new chapter after the kids go to bed. You can imagine how we'll that works out! Too bad we don't all live in the same community - we could ALL meet at Starbucks after drop off! Great ideas and lovely post Renee - thank you!